Following our amazing results at the ISTD Grand Finals in Blackpool last month we are delighted to announce three new Children’s Beginner Ballroom/Latin dance classes starting Monday 9th January 2017. The venue is Bognor FC, Nyewood Lane, Bognor Regis. These classes are term time only. We anticipate these new classes to be busy so register now to secure your place. That’s Rhythm Dancing School is founded by AISTD Dance Teacher Jools Ellis. Jools attended the Italia Conti Stage School and additionally Ballroom/Latin Classes with Peggy Spencer MBE, taking exams and competing in Junior Competitions. 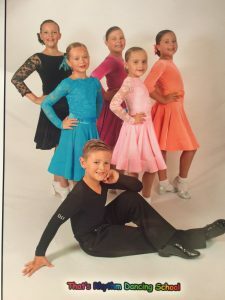 That’s Rhythm Dancing School offers Dance Classes for adults & Children in an extensive range of styles and disciplines, taught from the very first steps, specialising in the two left footers! Taking place at venues around Felpham, Bognor Regis we offer classes in: Waltz, Quickstep, Foxtrot, Tango, Viennese Waltz, Cha-Cha-Cha, Jive, Rumba, Samba and Paso Doble. Slow and Quick Rhythms.